You’re wondering which of Vietnam destinations to visit? I hope you’ll find the answer in this article. Vietnam is not a famous tourism country, not yet at least. However, there’re still many hidden charms that you may get interested, even surprised. Many of our landscapes are not so touristy, and thus may well suit your discovery trip. Here’re the top tourist destinations in Vietnam I pickup myself, hopefully you will like them. Sapa is the frontier capital of Sapa district in Lao Cai province. It’s a charming city lying in the Muong Hoa valley. You’ll see there the beauty of picturesque highland, rice terraced fields, minority people’s colorful costume, and fabulous French architecture church and villas. Tam Dao is situated in a green forest mountain range. It’s also Vietnamese national park with variety of flora and fauna. With cool climate all year round, Tam Dao plays as a nice retreat area for ex-pats and inhabitants from Hanoi. Halong bay stands out as one of the most attractive Vietnam destinations. You’ll see natural distinctive geological structure of limestone rising steeply from crystal-clear waters. The delicate combination of aged rocks, emerald sea, and blue sky depicts a romantic scene of the UNESCO World Heritage Site. Hoi An used to be a commercial seaport of Vietnam, where trading thrived among locals and foreign traders from Japan, China, and South East Asian nations. Now, it’s a great tourist destination with the architecture characterized by harmonious blend of Vietnamese, Chinese and Japanese influences. This look-like-a-desert is actually a part of Mui Ne area, next to famous Mui Ne beach in Phan Thiet city, Binh Thuan province. With pristine beaches, sand dune, and luxury villas, the place is known as the resort capital of Vietnam. 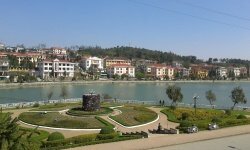 Da Lat is known as the city of love. It is endowed with millions of pine trees and distinct colonial architecture. Moderate climate, beautiful scene, and friendly people make the city to become the favorite destination for honeymoons and vacations. The historical site gives us a real proof of the hurtful Vietnam War. There you’ll see in an immense network of tunnels, which Vietcong soldiers secretly made underground of Cu Chi district and the regions nearby. The site now is open to tourists and you can crawl under safe parts of the tunnel system. I hope you find it interesting about the above Vietnam destinations? If you do, would you mind clicking Like button to encourage me? Thank you!